The Sheraton is truly the hotel of the Falls. Situated just one mile from the center of the town of Niagara Falls and directly across from the infamous Falls - the Sheraton On The Falls was rightly named. The breathtaking views and romantic setting make it clear why Niagara Falls is the Honeymoon Capital of the World. Whether planning a business trip and/or a personal get-a-way... Sheraton offers you the best. The closest airport is Buffalo Niagara International Airport at only 40 kilometers. This is a full-service hotel which features 670 modern well-appointed guest rooms and suites with panoramic views. The guest room amenities include air conditioning, in-room movies, telephone, alarm clock, balcony, cable TV and choice of city or fall views. Some of the accommodations feature fireplace, garden views, refrigerator, rollaway beds and non-smoking rooms. Available services include turndown service, maid service, concierge, 24-hour front desk, parking, room service and wake-up service. Each room and suite is designed to the specific needs of the business and/or pleasure traveler. 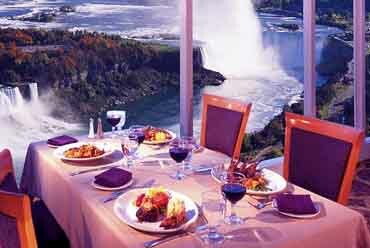 There are four choices of cuisine on-site at the Sheraton On The Falls Hotel. The world-famous Penthouse Fallsview Dining Room features a five-star 80-foot buffet. The Penthouse services breakfast, lunch and dinner. For the guests' convenience there is the lobby cafe which serves Starbucks coffee. The Canadian Cafe serves a light menu and is open from 6:30 a.m. to 11:00 p.m. The Piano Lounge offers atmospheric intimacy and entertainment. Just a few steps from the Sheraton-On-The-Falls is the themed dining of the Rainforest Cafe, Hard Rock Cafe and Planet Hollywood which are all located on Falls Avenue. The Sheraton-On-The-Falls is a full service, luxury hotel which offers a casino complex on-site, indoor pool, state-of-the-art spa and fitness center and a shopping concourse. 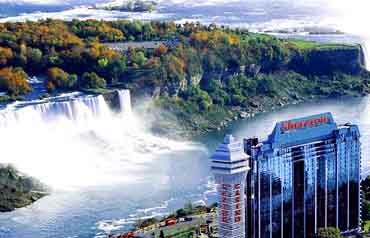 The hotel is directly connected to the Casino Niagara which is a 200,000 square foot casino which offers thousands of slot machines and hundreds of table games. The full-service, on-site spa by Christienne offers full spa services which include massage therapy and body treatments to pamper your lifestyle. Niagara Falls is the Honeymoon Capital of the World and no where else can the drama and romance of a wedding be equaled as to that at the Sheraton-On-The-Falls. For any and all business conferences and meetings or banquet of a lifetime - the facilities at the Sheraton-On-The-Falls are unequaled in all of Niagara. This is the largest conference center in Niagara and one of the largest in all of Canada. There are 22 meeting rooms ranging in size from 729 to 17,391 square feet. These facilities will seat 80 to 2,300 participants. The hotel offers a full service Business Center to assist with faxing, copying and secretarial services along with audio-visual capabilities. The professional staff of the Sheraton-On-The-Falls insures your visit, whether business and/or pleasure is a successful one.